Editor/Author Rosen, Paul Peter, Hoda, Syed A. and Brogi, Edi, et.al. 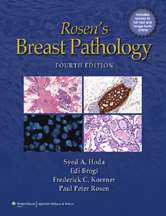 For three editions, Rosens Breast Pathology has been widely recognized as the "gold standard" reference. Now in its Fourth Edition, this classic text continues its legacy of being the leading reference work on the pathology of the breast.